The wearable market is growing continuously. Each day, new products are being developed and rushed to market in a ultra competitive landscape. For aspiring entrepreneurs, finding the right exposure for your product can be daunting and frustrating. There are so many choices, where do you start? This also makes acquiring the proper media attention for your product or service nearly impossible. You can always publish a press release to major news sites, send out promotional copies and advertise on social media as much as possible. However, none of these strategies are guaranteed to bring in readers. A Product or Service Review from Our Featured Program! – Not only will we deliver an unbiased, press-worthy review. But we will also continue to promote that content – and your product – for a specified period of time. 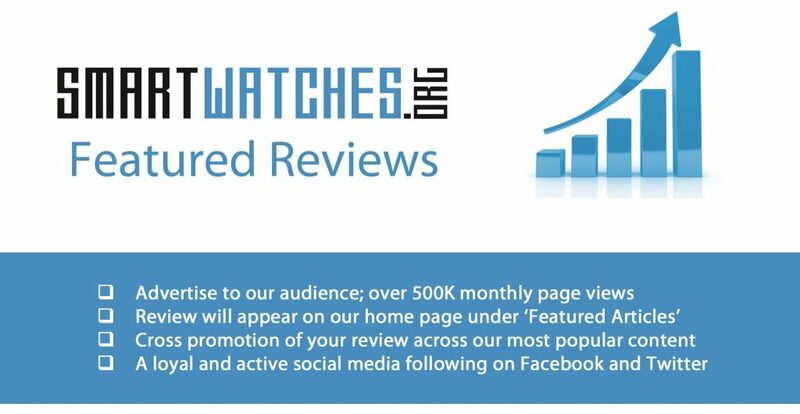 This opens you up to our audience, which includes over 500k monthly page views on SmartWatches.org and a loyal social media following. We offer three types of reviews on our site. Standard Review: We will review your product based on a hands-off perspective. We will conduct expansive research. Before printing a single word, we’ll be sure we know it well. Hands On Review: We will review your product based on experience. Our reviewer will take their time using the product in question and will learn everything about it. We will take high-quality photos, and share those on our site and in our review. Featured reviews will take priority. Featured Review: With this review, we will feature the content on our site for a period of 30 days. This results in far more exposure than a regular review which may get pushed off the front page and buried among other content. Our featured review gets you in front of our engaged users using the following methods! Please keep in mind, all reviews will remain unbiased. Fill out the fields below and we'll be in contact shortly. Featured Reviews are streamlined and posted within 2 weeks.